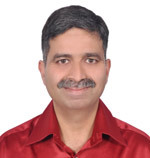 Brig Ashish Chhibbar joined IDSA as Senior Fellow in July 2018. An alumni of National Defence Academy and Defence Services Staff College, he has had varied command and staff tenures in all terrains and operational areas. The officer has done his ME from Indian Institute of Science, Bangalore and PhD in Strategic Decision Making from Chaudhary Charan Singh University. His current interests are in disruptive cyber technologies of Blockchain, Artificial Intelligence and Big Data Analysis.